We were off on holiday and it was the usual scramble to try and use up perishable food before we left. A punnet of slightly under ripe apricots was one of the food items that needed attention. 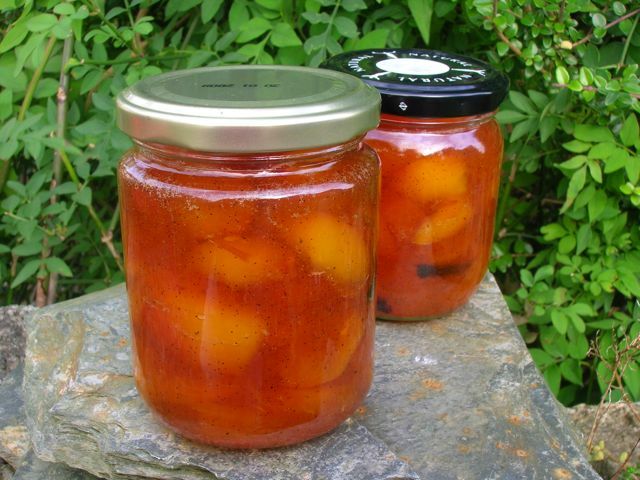 With all the talk of fairtrade vanilla on BBC Radio 4 and Vanessa’s blog back in August, it was a question of poached apricots in vanilla syrup or making jam. I plumped for the jam and oh boy, I’m so glad I did. I used Trish Deseine’s recipe as my guide, but reduced the quantity of sugar to fruit and added some water. Washed 400g apricots, then chopped and de-stoned them. Put into a stainless steel heavy bottomed pan with 300g caster sugar and the stones. Cut a vanilla pod into bits and scattered this over the sugar. Squeezed in the juice of a lemon and added a splash of water. Left overnight for the flavours to infuse. Bought the mixture to a gentle simmer and stirred until the sugar was completely dissolved. Bought it up to a rapid boil and let it go for a good ten minutes or more until the jam went from frothy to clear and setting point was reached (jam wrinkled when dropped onto a cold plate). Removed the stones and spooned into two sterilised jars. The jam turned out to be a beautiful golden amber colour and looked really pretty flecked with vanilla seeds – and it didn’t stop there. It set well and tasted sublime, tart and fruity, but still sweet and aromatic. I haven’t yet used the jam as I’ve been saving it for something special, but I have yet to decide what that special something is going to be. I am entering this into Susan’s Home Made & Well Preserved challenge over at A Little Bit of Heaven on a Plate in the vague hope I might get lucky and win a copy of First Preserves by Vivian Lloyd. This was, of course, made from scratch as is the vast majority of what I make, so I am entering this into Mr JW’s Made With Love Mondays. As this is J for Jam, I am also entering it into this month’s Alpha Bakes with Caroline Makes and The More Than Occasional Baker. This sounds gorgeous, it’s a beautiful colour too. Can’t wait to see how you use it. I love apricot jam. Infact I am really addicted to it. You have done well at making it yourself ! Thank you Alida. Apricot jam is one of the best, but I have an aversion to shop bought jams which always seem to have too much sugar in them and over processed fruit, so I don’t get to eat it very often. Wow, this looks and sounds fantastic, Choclette! I’ve never had apricot and vanilla together, but I’m sure it would be delicious. Vanilla bean with most fruits is marvelous… I’m so glad you decided to share and I’m so impressed that you took the time to make your own jam… So cool. Thanks JW, homemade jam is so much nicer than shop bought, which I always find too sweet. This was the first time I’ve used vanilla in jam before and it was a great success. I don’t think I could resist just eating it by the spoonful! It looks perfect. I’ve been remarkably restrained, but I’m not sure how much longer I can hold out. Oh major jealousy attack! Apricot jam is my favourite and with vanilla it will be divine. I love the colour of your jam, what a great way to use up those apricots! Thanks Nic, the colour is just what I need to cheer me up at this time of the year. Ha ha, thanks for picking up on that little blunder Susie – the two jars would have been gallon jars! Now corrected. One of my favourite jams. Homemade one definitely tastes better! Thanks Angie. I’m very fussy when it comes to jam and can’t bear all the sugar in shop bought jams – homemade is infinitely better. Johanna, I’ve never made sachertorte, so suspect that’s what I may end up making with it. I just need a suitable occasion. Jam on good bread is delicious but not something I do very often and I’ve never had it with cream. I don’t know why not given that I wouldn’t have a scone and jam without cream. Apricot Jam is just brilliant for so many things… glazing and lining pastry… this is beautiful C, really beautiful! Thanks Dom. The number of times I curse not having a jar of apricot jam when it’s needed for a recipe and now I’ve got one I’m not too sure what to make! Apricot jam is my favourite jam. It sounds so easy to make. I am not a jam maker expert, but I’m learning a lot of things reading posts like yours. I’m looking forward to read a recipe containing homemade apricot jam. Rita some jams are much easier than others, this one was really quite simple and it is really delicious. That sounds delicious. I do find that the apricots we get here sometimes need a hand in boosting their flavour so vanilla sounds like a great addition. I remember making some blueberry and vanilla jam once that was pretty good too. You are so right C, I don’t think I’ve had a really good ripe apricot here in the UK. Vanilla is such a good addition, I will try and remember it next time I make jam. After reading about yours and Jude’s apricot jams I am dying to make this next year. It will be top of my list although I would not be able to save it. I made some lovely apricot compotes this year but now am wishing for them to be in season. Hope you tell us when you do use it or maybe you will just eat it on toast! Its a lovely colour – still trying to enjoy apricots its a work in progress affair! Maybe jam would be a good start!